I went looking for Albert Einstein and stumbled upon an old friend: the Newspaper Reader. It was the summer of 2011. Having gone to Princeton University to visit a friend, I stepped out for a leisurely walk around the picturesque campus town. I knew Einstein had spent the last two decades of his life at Princeton’s Institute of Advanced Studies. I was trying to locate his statue on the walkway that leads to the Princeton Borough office. 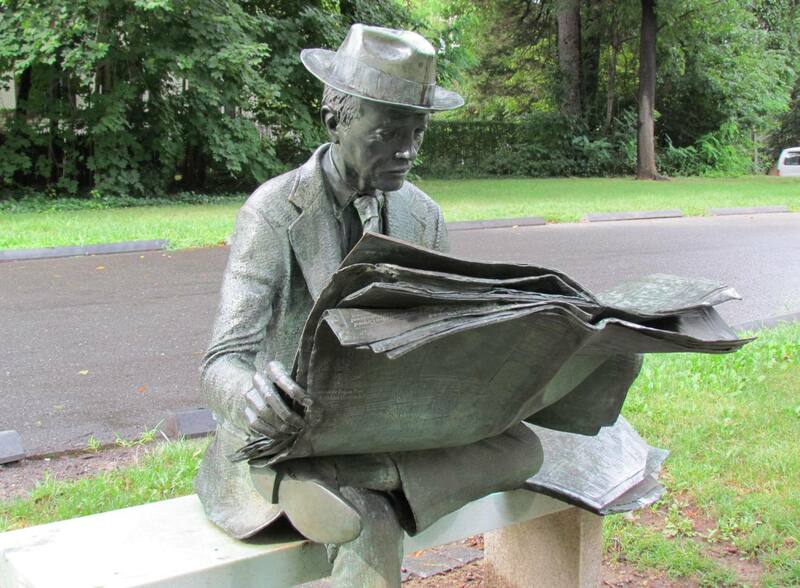 That’s when I saw the “Newspaper Reader”, a life-size bronze sculpture was of a formally attired man seated on a park bench and reading an opened, broadsheet newspaper. A closer look revealed that it was The New York Times of 9 August 1974 – the day Richard Nixon resigned as President of the United States. Newspapers played a key role in his downfall. I was intrigued by this public art celebration of what used to be, until recently, such an ordinary and regular part of many people’s daily routine. I soon found out (from Aunty Google) that this was one of several such sculptures that the well known sculptor Seward Johnson, Jr., had produced. The artist wanted to tempt Americans to get back outdoors in the early 1970s, when a crime wave made many avoid public spaces. “I put sculptures into parks to act like decoys and entice people back to parks,” he was quoted in the Princeton Magazine as saying. They didn’t say how well he succeeded, but it struck me just how much has changed in a single generation. Reading a daily, printed newspaper is no longer such a common experience for many. That’s bad news for the industry that I have belonged to for a quarter century. In many parts of the world, newspapers and magazines are losing circulation, audiences and revenues. Some have downsized, while many old and cherished titles have simply disappeared. This crisis is more intense in some markets than others. In Asia, print is still relatively robust, and in countries like India and Thailand, newspapers are still penetrating new markets as millions join the middle class. But the trend is clear: the printed newspaper, especially in its current form, is threatened, and may even be endangered. Business models that worked for decades or centuries are no longer viable. It will take more than a few exquisitely crafted statues to bring readers back. Indeed, the newspaper industry is challenged to reinvent — or perish. The reasons for this decline are complex and nuanced, and generalisatons can be misleading. It has become fashionable to blame it all on the web, but that’s only part of the story. We must look deeper to understand the roots of this decline. Back in October 1993, American science fiction and thriller writer Michael Crichton wrote a now famous essay titled “Mediasaurus” in Wired magazine. There, he boldly predicted the death of mass media as we knew it. Crichton knew a thing or two about dinosaurs. He wrote Jurassic Park (1990) which Steven Spielberg turned into a blockbuster movie three years later. While writing it, Crichton studied the rise and fall of the colourful lizards who dominated our planet for tens of millions of years before going extinct. When the author looked around, he saw parallels with the mainstream print and broadcast media of his land and time. He found them arrogant and brazen. He foresaw audiences migrating away from such media — because they no longer found it relevant or useful. Unlike activists and academics who endlessly preach about media’s social responsibility, Crichton analysed the media as an industry whose product was information. He found that the American media were distributing a product of very poor quality. Paying consumers were not going to put up with it for too long, he argued. Only those nimble, adaptable media products would survive. The rest would be wiped out by new technologies that helped readers and audiences customise what they wanted. It took much courage and foresight to say this when the World Wide Web was still in its infancy. Yet Crichton saw it coming, although his timeline was a bit off. 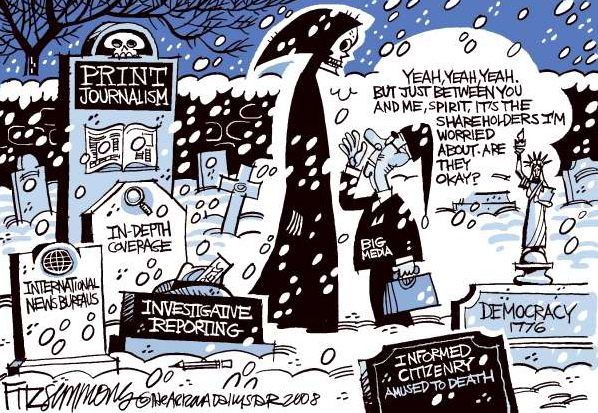 By the time he died in November 2008, the newspaper and broadcast industries were in free fall — and not just in the US. Sure, the industry is putting up a good fight. Newspapers, for example, are going compact, jazzing up their websites and extending to social media platforms. But many still struggle to balance production costs with diminishing incomes from sales and advertising. I take no joy in surveying this scene. Beloved icons of my childhood and youth are folding for good, or going entirely online. News magazines have been the hardest hit. Asiaweek and Far Eastern Economic Review, once trusted and admired titles, were early casualties. On 31 December 2012, Newsweek will publish its last print edition and embrace an all-digital format. Going digital, by itself, is not a recipe for survival. In fact, there is no silver bullet or magic cure. But going back to the media basics can help. Some call it the A, B and C of good journalism: accuracy, balance and credibility. That’s certainly necessary — but not sufficient. The media must engage readers with respect and humility. And provide value for their attention, time and custom. For too long, journalists and broadcasters have taken their audiences for granted. As a whole, our kind has behaved with an arrogance and superiority derived from privileged access – to news events and newsmakers. That world is falling apart as information society consolidates – and not a moment too soon! Our audiences are no longer passive consumers of media’s information and opinions. Ubiquitous mobile phones and rolling out broadband Internet has turned things upside down. The first drafts of history are now being written, in part, by the ‘former audience’ – a term coined by Dan Gillmor, mainstream journalist turned citizen journalist and media activist. Not everyone exercises that option, but they can whenever they choose to. This changes the rules of the game for full-time, paid journalists who do that for a living. Teachers have had to switch from teaching to learning (some grudgingly so). 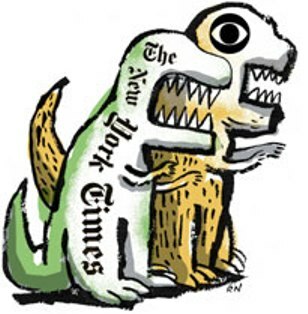 Sooner rather than later, former news monopolies must come to terms with this new reality. In this radically altered information ecosystem, there still are plenty of niches they are well suited for — such as curating the news, providing perspective and clarity, and carrying out long form and investigative journalism. First and foremost, however, we in the media must recalibrate our relationship with you – our readers, no longer our captive audience. In other words, if we insist on business as usual, it will be a short march to irrelevance and obsolescence. That’s the clear message from our readers. This entry was posted in Journalism, Media, Television and tagged Albert Einstein, Asiaweek, Charlie Beckett, Dan Gillmor, Far Eastern Economic Review, good journalism, Internet, Jurassic Park, Mediasaurus, Michael Crichton, news monopolies, Newspaper Reader, Newspapers, Newsweek, Richard Nixon, Steven Spielberg, Wired. Bookmark the permalink. 3 Responses to When Worlds Collide #42: A Message from Our Readers!